Do you have questions about our Magnum Energy fuses, or questions about solar in general? Give us a call at 1-800-472-1142. 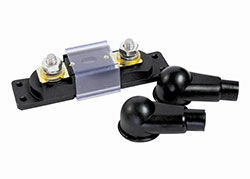 Magnum Energy fuse block assemblies are the perfect code compliant over-current protection. They are used to protect the battery bank, inverter and cables from damage caused by short circuits and overloads. They also employ a time delay to allow temporary current surges common in inverter applications. Protection against costly damage: The ME-125F, ME-200F, ME-300F, and ME-400F protect the battery bank, inverter, and cables from damage caused by short circuits and overloads. Fuse size is determined based upon the size of the conductor between the battery and the load. Factors such as the length of the cable between battery and load and wire type of the conductor as well as conductor temperature rating all affect the conductor’s current carrying capability. The 125 and 200 amp models use an ANL type fuse and the 300 and 400 amp models use the Class-T fuses. Magnum fuse blocks are ideal in applications where over-current protection is required for high current components such as inverters and chargers. Complete kit in one package: Magnum Energy fuses include a Slow-Blow high current fuse, a mounting block, and protective cover. Used to protect the battery bank, inverter and cables from damage caused by short circuits and overloads. Include a Slow-Blow high current fuse, a mounting block, and protective cover. All fuse block Assembly use a fast acting, current limiting fuse cartridge, which provides instant protection with a short circuit.